Inspirational young singer Joseph chosen to star with Sir Bryn Terfel at Llangollen Eisteddfod | News by Wales Express News, People Before Profit! An “inspirational” young singer who overcame a rare kidney condition has landed a dream role to perform with opera superstar Sir Bryn Terfel. Joseph Elwy Jones, 11, will take to the stage at the Llangollen International Musical Eisteddfod as the Shepherd Boy in a star-studded production of Puccini’s classic opera, Tosca. The concert on Tuesday, July 4, which is being sponsored by arts-loving care organisation Pendine Park, also features two other world-class opera stars, soprano Kristine Opolais and tenor Kristian Benedikt. 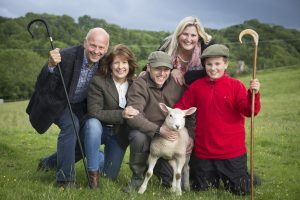 Mario and Gill Kreft with Farmer Daniel Jones, Abi Jones and Joseph Elwy Jones, 11, who has won the coveted role of the Shepherd Boy in Tosca at the Llangollen Eisteddfod. It will be one of the highlights of the week when the iconic festival will be celebrating its 70th anniversary. Joseph, from Lixwm, in Flintshire, won the role after a tough audition against the cream of young Welsh singers – thanks to the extra lessons from the headteacher at his school, Ysgol Gwenffrwd, in Holywell. He was diagnosed with Nephrotic Syndrome in 2013 but it cleared up after treatment, including steroids, and he hasn’t had any reoccurrence. Football and guitar player Joseph is now fully recovered and raring to go – and he can’t wait to meet and sing with his idol, Sir Bryn Terfel. Pendine Park proprietor Mario Kreft MBE said: “Joseph is not only a supremely talented young singer, he is also an inspiration to us all in the way he has overcome the health problems with great courage and determination. “As a care organisation, Joseph’s story has an undoubted resonance for us and it is wonderful that he is once again full of vim and vigour – and blessed with an absolutely fantastic voice. Joseph was thrilled when he heard he had been chosen as the Shepherd Boy. He said: “After the audition I had to wait about a week, which seemed a long time and the longer it went on the more I thought I hadn’t got the role. Then, I was at school and the head teacher Miss Owen came into class and told me the good news. I was speechless! “I was amazed and I can’t wait to meet Sir Bryn Terfel. I’ll be nervous but as soon as the music starts I’ll be fine. I’m taking loads of paper with me because all my friends have asked me to get Sir Bryn’s autograph. According to mum Abigail, a teacher at Ysgol Llywelyn, in Rhyl, the whole family was extremely proud. “His sister Sophia, seven, is learning how to play the keyboards and his Dad, David, who teaches English at Flint High School, has two drum kits. It’s quite a musical family! “She is amazing and once we knew he had an audition I asked her if she could help him learn the part. He watched YouTube performances to help but singing in Italian isn’t easy of course. “She spent time helping him and even got him into school on a teacher training day for an hour. “When I was told Joseph has landed the role I thought it only fair that she be the one to tell him the news. She sent a lovely card the following day congratulating him. “It’s quite fitting in a way that he has been chosen to play the Shepherd Boy in Tosca because his great grandfather, Victor Thomas, who was the head of a Veterinary practice in Caerwys, kept sheep all his life. Ynyr Lewys Rogers, 12, from Ruthin, a pupil at the town’s Ysgol Brynhyfryd, has been chosen as Joseph’s understudy. The Llangollen Eisteddfod has been a springboard for the careers of many singers including Sir Bryn Terfel himself when he was a young bass baritone and the legendary Luciano Pavarotti who first competed at the festival with his father’s choir from Modena in Italy in 1955. The festival’s music director, Eilir Owen Griffiths, said: “Increasing opportunities for youngsters to become involved with music is a cause close to my heart and that of sponsors Pendine Park – who’ve also generously tripled this year’s Voice of the Future prize fund. “It’s incredibly exciting to find such promising singing talent like Joseph. The innocence and purity of his voice was perfect for the angelic role of ‘Shepherd Boy’. The character brings light to the darkness of the piece and Joseph’s voice makes him the perfect candidate for the role. Indoor car boot sale in Llanrwst. Uk Hottest Day on Record 2018. Early May Bank Holiday Weekend.